Inspired in part by the lions at Elizabeth Street Garden and in part by a dear cat named Pangur with whom I lived for several years. In fact, there are a lot of feral cats in New York City. Far more than there are stone lions. But, also, the presence and personality of the stone lions I observed when out painting really struck me. They seemed the ideal garden dwellers. They sit among the flowers, not taking attention away from them but elevating their status. 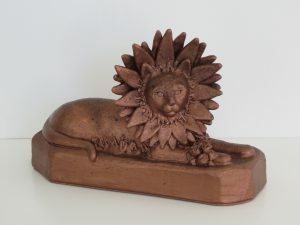 A garden with a lion is not just a piece of earth with some plants: It is a Place – the way a palace is a Place.